All structural parts of CNC horizontal boring machine are manufactured from high quality cast iron tempered and stress relieved at Sahil machines. It has a movable column and minimum deflection of spindle extension. The total rotary table or long table is concurrently controlled type which is optional and standardize. The column is made of grey cast iron. Topmost rigidness and durability of the column is achieved through the process of toughness which also leads to precision and rigidity in metal-working procedures in production. The servomotors for all CNCs horizontal boring machine can be control 5 or more axes position data of the machine at the same time. The motors are straight way linked to the ball screws that limits backlash and a higher inflexibility between the drive and the ball screw. Therefore it is possible to achieve very precise linear, circular and spiral interpolation. The rotary movement is attained through two pinions, each of them having its own servomotor. The principle of its operation is often described as a Master-Slave Function. 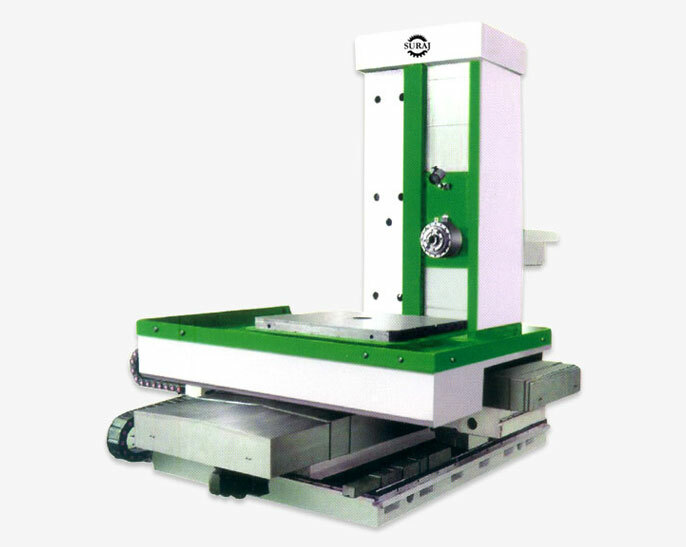 As a standard, the rotary table operates as a continuous 4 axis. The lengthwise and crosswise bed of the machine is made up of grey cast iron which strengthens through annealing. It was sketched in order to assimilate the maximum amount of vibrations that are created during cutting. All service cases are automatically inscribed in the service database together with the time schedule of the particular case and a responsible person. This system allows better management and communication with the customers. As soon as the case gets recorded under the system, we immediately send our responsible technician with the necessary equipment. The Horizontal Boring Mill provides a small footprint, large work envelope, and is heavier and more rigid than competitive boring mills in its class. The HBM 1500 is equipped with a 2-speed geared spindle head and hardened box ways. The HBM 1500 delivers a superior package that includes features you need for typical applications instead of requiring you to add them as options.